What's in a name? That which we call a couple of ruthless Scots taking over NXT UK and calling it their "kingdom"? The answer is Gallus, apparently. I have no idea the word means or what it refers to (DM me if you do for some banter), but I like the sound of it. It's cool and sort of aggressive, like Ariane's Grande Thank You, Next music video if you're a fan of Victorious and Mean Girls, but I digress. This week was another great two-for-one show featuring the likes of Jordan Devlin, Flash Morgan Webster, Moustache Mountain, a returning Travis Banks, and finally an NXT UK Women's Champion in Rhea Ripley. My Internet connection is still terrible, but thank Mod for this brand. Eddie Dennis continuing his winning ways was expected, I'm not going to lie. Tucker's good and interesting, but Dennis has that extra "oomph" that really sets him apart from everyone he's faced so far. Aside from that, it's too early for Dennis to lose a match. His streak should continue at least until he gets into a real storyline like, I don't know, something about that whole terrible friends angle with Mark Andrews or even United Kingdom Champion Pete Dunne? That Severn Bridge with the Neckstop Driver is pretty interesting to see. NXT UK Women's Champion Rhea Ripley had her first title defense this week and it was against her handpicked opponent, a pink-haired 18-year-old Candy Floss. Okay then. Is Candy Floss going to be a part of the women's division or was she just NXT UK's version of Blue Pants? NXT should've signed that wrestler, to be honest. She was a fan favorite. As everyone would've guessed, Ripley destroyed Floss, putting her away with her Riptide finisher. Because Floss surprised her with that dropkick, Ripley did the only heel thing to do: feign respect so your mark can drop their guard for your unwarranted assault. Nice. I can't wait for Tegan Nox to get healed up and feud with Rhea. That should be pretty awesome. In order to bounce back from his United Kingdom Championship loss, which was a really amazing match, "The Import Killer" Jordan Devlin faced and beat up the "Modfather" Flash Morgan Webster. Devlin dominated Webster in this one, and I'm not just talking about in terms of wrestling. That "you don't belong at this level" line was brilliant. Finn Bálor should be doing stuff like this on RAW, not smiling too much like a complete weirdo. Comparing Devlin and Bálor makes me sad. Bálor could be better, but at this point, Devlin's beating him, to be honest. I'd much rather watch a Devlin match than a Bálor match, and that's not Bálor's fault. It's just been him against either Lashley or Corbin these days, losing clean or dirty to either or winning by some sort of trickery, and that's just boring. What's his new feud now? Drew McIntyre? That might be good. Sigh. I'm not sure if I like Webster or if I don't. He's interesting in a strange way. You look at him and you easily go, this guy has a gimmick all on his own. But something about him is just off with me. That said, guy can sure move in the ring. He's fast and he's agile and he's creative, I'll give him that. Unfortunately, a swanton to Devlin's knee wasn't that creative, so he lost this match. This was the main event of part one of this week's edition, and Devlin and Morgan did fantastic headlining this show in singles competition. In part one, the Scots cut a promo in which they continued to refer to NXT UK as their "kingdom" and finally to themselves as Gallus. I really like how that name sounds. Travis Banks interrupted them, finally making his triumphant return to the brand, and Moustache Mountain made the save to even the odds when the three-on-one advantage took its toll on Banks. This was a textbook efficient opening segment that served more than one purpose, which is, dare I say, rare for the WWE. Things escalated in part two when Travis Banks faced Wolfgang inside the squared circle. The numbers game, as expected, played a part, with the Coffey Brothers trying to help Wolfgang, so Moustache Mountain came out to make the save yet again. Well, just the momentary distraction so Banks can fly through the ropes to take the brothers out himself. In a sneaky but hilarious twist, Trent Seven grabbed Wolfgang's foot while the referee's back was turned, allowing Banks to get the win through the otherwise nefarious method. Glad they were the faces. Eddie Guerrero approves. FINAL DECREE: This week had some great developments with Gallus finally getting a name and NXT UK Women's Champion Rhea Ripley heeling it up in her first title defense. That thing with Sid Scala as Assistant General Manager has some promise, but it seems meh because of Baron Corbin's storyline over on RAW now, so I'm not expecting much out of it. I'm still giving it a shot and this week's NXT UK another A. There's just no stopping this brand. Joseph Conners apparently lost half of his ear in a bar fight, so he targeted Dan Moloney's earlobe early in their match. Randy Orton approves. Moloney hitting Conners with a spinebuster was unexpected but that corner bomb sealed the former's fate. Conners is getting on a winning streak after dropping that dead weight named Saxon Huxley. Judas chants incoming. Dave Mastiff versus Mike Hitchman was bloody captivating. I shouldn't have been surprised. Mastiff's matches have been pretty fun and Hitchman is a great character. I really think that. Hitchman is cool. Unfortunately, Mastiff didn't agree, raining down elbows on Hitchman's face, throwing several more strikes at him, including a headbutt, before doubling down with that senton and the almighty cannonball in the corner. Ouch. When you talk about contrasting styles, you can add the Ligero versus Tyson T-Bone match as your reference. Ligero's a high-flying luchador from the UK and T-Bone's a bruiser-brawler who just doesn't care about making his moves look pretty. If it makes the other person scream in pain, it's all good for T-Bone. That heavy right hand's going to sting until the end of this year. Ligero winning was a great cool, though I'm not sure where T-Bone's heading with this loss. Because Travis Banks has new besties now, Mark Andrews busied himself by facing Fabian Aichner. Both of these men are very talented and have appeared on NXT once or twice. This was Aichner NXT UK debut, though, and the handshake before they duked it out in aerial supremacy was a touch. Unfortunately, because they were evenly matched for most of the bout, Aichner resorted to slamming Andrews into the steel steps and then pinning him with that gorgeous tilt-a-whirl powerbomb. I can't wait to see more of Aichner. Isla Dawn went over Nina Samuels with a backdrop driver before a suplex, and I thought that was a great idea. Samuels has yet to stand out as a character while Dawn already has that "White Witch" moniker down pat. Pretty decent match. Sid Scala, who's had more losses than wins so far was appointed, by GM Johnny Saint as Assistant General Manager. NXT UK Women's Champion Rhea Ripley made fun of him before telling him to give her some competition. I was caught off-guard by this development because so far NXT UK's been focusing more on in-ring shenanigans than backstage shenanigans. GM Saint might be a legend in the ring but he's really not that interesting promo-wise. Will Scala's new role fix that? Will this whole thing amount to anything? I'll give it a shot. We're getting Trent Seven versus Joe Coffey next week, so I'm guessing Tyler Bate will face Mark Coffey soon after, but before a six-man tag match that Gallus will win. They're not losing that kind of match unless it's against British Strong Style. Also next week, we're getting an update on NXT UK Tag Team Championships. I can't wait! 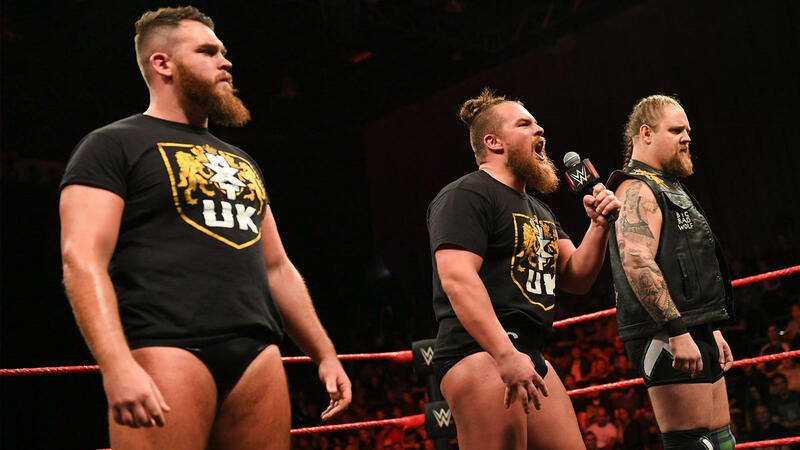 Jofer Serapio (@ShawarmaJoe) reviews WWE RAW & NXT UK for Smark Henry. He has been an avid professional wrestling fan since grade school. These reviews are as close to professional wrestling as he can get. He's so proud he didn't make one UrGallus pun in this review.